Brick Lane Hostel i Varanasi, Indien: Reservér nu! Brick Lane Hostel welcomes you by offering hospitality services par excellence. You experience the Grandeur of Ganga, the pomp of Ganga Aarti & 100s of temples in close proximity, being situated a 3 min walk away from Assi, the gateway to Ghats. 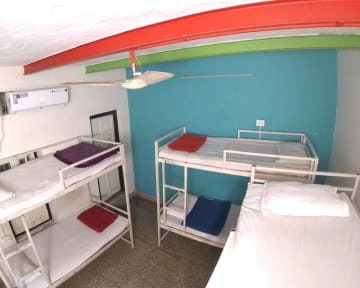 Being Backpackers ourselves, we know the importance of staying at a hostel where you get all the necessary amenities, which is clean & most of all, the staff is affable & helpful, basically, a home away from home. We proudly welcome you to explore ‘the oldest living city in the world’ with a guarantee to make your stay a memorable one. 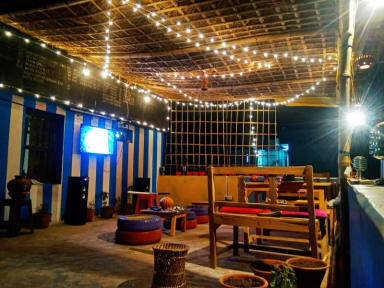 We have plenty of common space for you to chill at the rooftop café (SHACK 28). An array of social activities like daily yoga sessions, live music performances in the evenings, Boat Tours, Temple Tours, Eat Street Strolls etc. are a few of the highlights of our hostel. Brick Lane Hostel provides dorm room as well as private room. Free wifi features the whole property. We aim at providing the most authentic feel of Varanasi by a measured blend of experience, knowledge & the will to deliver. 2. Check in: 24 hours.